Top-seeded pair of Rohan Bopanna and Divij Sharan registered a dominating first round win on Day Two of Tata Open Maharashtra here at Mhalunge Balewadi Tennis Stadium on Tuesday. The Indian pair outclassed Radu Albot-Malek Jaziri pair 6-1, 6-2 to live up to their top billing at India’s only ATP World Tour event. 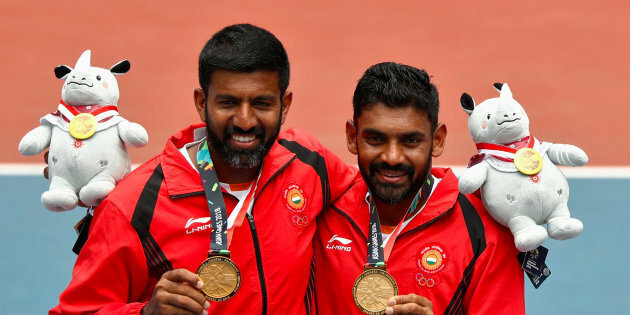 Playing on Court 1, the Asian Games gold-medal winning duo took less than an hour to move to the second round dispatching the Moldova-Tunisian pair. They will meet the winner of L Paes/ M. Reyes-Varela vs D. Marrero/ H. Podlipnik-Castillo. Meanwhile, India’s Saketh Myneni, who entered the main draw after two gruelling qualifying matches, withdrew due to a foot injury. Thiago Monteiro came in his place a lucky loser to face France’s Benoit Paire. The fifth-seeded Frenchman got the better of Monteiro in straight sets 7-6(5), 6-3 with 18 aces. In the first match at the centre court, Ivo Karlovic got the better of Felix Auger-Aliassime 6-4, 7-5. The match between one of the youngest players and the oldest at the event lasted for an hour and 14 minutes where the 39-year old Croatian hit 13 aces enroute the straight sets win over the 18-year old qualifier from Canada. Karlovic broke Auger-Aliassime in the fifth game and held on to his serve to lead 4-2 and eventually won the first set 6-4. Auger-Aliassime put up a stronger show in the second but Karlovic broke him in the 11th game and dished out three aces in the final game to seal the second set 7-5 and the match.